There it is! Don't you see? Catch it! Catch it! Catch it now. Feel its grandeur, hear it sigh. But I cannot see it now. For it flies away so fast. Catch the memory and make it last. I wrote the above poem when I was a teenager. And I truly had no idea what it meant. But something told me to save it. Fast forward 35 years later. I had decided to give up my computer helpdesk career and become a full time nature photographer. I was sorting through papers and I found this poem again. 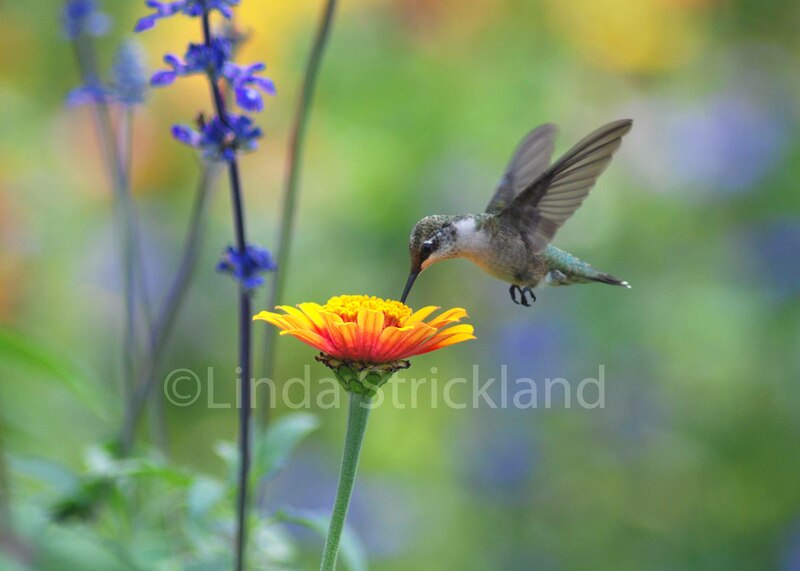 It astounded me how much it matched the above picture of a hummingbird, almost down to every single color! She is sipping sweet food from a zinnia. And because she is eating, her wings slowed down enough to be able to capture the detail you see. I thought to myself, how perfect! This is what my poem meant. When you see a hummingbird, it does seem like a moment in time you want to slow down. And make it last. And remember it. Some of our memories are this precious. Are they not? I did not always know I wanted to be a photographer. My first sign that this was a possibility, happened during a visit to Florida, where I sustained a serious head injury. I was at a yoga retreat, and a huge board fell from the ceiling and hit my head. I did not even know the board was falling until I heard something loud hit a door, and then it ricocheted back onto my head. The noise gave me a warning that something was falling and somehow my hand reached out to push it away from me. It all happened so fast. I didn’t realize I was having a concussion. I started to cry and I didn’t want to eat anything. My roommate tried to comfort me. The only time I felt ok was when I looked out the window and saw a beautiful white heron land in a body of water. It spread its huge white wings and I derived such comfort from seeing this beautiful sight. I didn’t realize that was the last time I would feel really good! For a while. Somehow I made it the airport and got home. I think my body was in shock. It took me 2 or 3 months for the dizziness to go away, and 3 years for my neck to be fully mobile. In the meantime, I went back to my miserable desk job and the people there were not sympathetic. I often felt sad and depressed, like my life had no purpose. I was ok at my job, but not great. It was not my passion. And I always felt like something was missing from my life. I noticed that when I was outside in nature, I felt best of all. Whole. Complete. Blessed. And I was seeing herons everywhere! According to Native Americans, when you see a heron it means that you need to seek your truth. I do believe that we have signs all throughout our life, guiding us and moving us in the right direction. All of us have a special purpose, and all of us have different talents that should not be ignored. Don’t wait for a 2×4 to fall on your head! If you have stirrings and longings, take action. Do what your heart desires. Live your life on purpose. O boy! This brings back memories, and not the most pleasant ones. Piece of wood or TV we certainly did not feel good for a while. But it’s prompted us ti listen to our desires, has it not? Indeed, let’s live in sync with them. THAT feels good! Yes Maryse, I know! Believe me. But it was actually helpful to write about this. Gave me some fresh insights and took away some of the power this memory had over me. Carpe Diem, my sister! So glad you are brave and true to yourself no matter what the skeptics may drone from their lockstep lives! I am so very proud of you! Thank you Nancy. I know you are, and that’s so nice to hear. Proud of you too! Thank you Sonel! Your pictures show that you feel blessed. I always enjoy the messages along with the photos. So inspirational. Lin, you are inspiring me to listen to my “stirrings and longings.” I’m so glad you have found your calling. Love you, little sis! It’s so nice to hear you say that. As you know, it only took me 50 years to get a clue! -): I know you have so much to offer. Looking so forward to seeing you soon and hearing all your ideas. So glad you saved that poem. And I totally believe in signs. Great post. I have come to believe in signs too, lifeonwry. Because of experiences like these. Thank you Robin for your comments. And no, feeling your grandfather’s spirit in a cardinal does not sound too wacky to me! not at all. I can totally relate to that. I will try to find your story! You have me intrigued now.